QUESTION: What are your favorite tests that challenge riders in a Medal class work-off and why? 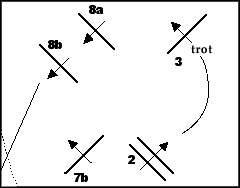 After the first round of an equitation final or medal class, the top scoring riders are asked to perform additional riding tests in a work-off to decide the placings. Our judges were asked for their favorite tests – the ones they thought challenge the riders, separate “the men from the boys,” and reveal the strengths and weaknesses of equitation competitors.